In the 45th issue of the Bed and Breakfast Traveller, we take you to the Canadian Badlands region of Alberta, where the past and present combine to make a unique visitor experience. Not so very long ago, Coal was King. Coal fueled industry and transportation, and kept people warm in their homes. So when coal was discovered in the empty valley of the Red Deer River in what was not yet Alberta, that was big news. Coal meant trains, and trains meant the westward expansion of a fledgling nation, and expansion meant more customers who needed coal to live. The stage was set for entrepreneurs. The first entrepreneur took a chance in 1911. 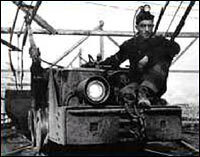 Sam Drumheller opened the first coal mine in what was later to be called the Drumheller Valley. In short order, 138 more mines were registered. The track was laid, and the world swarmed into the valley. Immigrants from Hungary, Ukraine, Italy, Britain, America and Canada arrived by the trainload ready to work. Shacks sprang up around pitheads, and communities mushroomed. Made up largely of single men, Drumheller's coal mine communities were known as hotbeds of drinking, gambling, fighting, and women of questionable morality. The Atlas Coal Mine National Historic Site tells the stories of the mines and the miners who carved Drumheller out of the badlands of the Red Deer River. The Atlas was the last of Drumheller's 139 mines to close, and preserves a nationally significant historic industrial landscape. The last wooden tipple in Canada looms over the ghostly wash house, mine office, outbuildings and machinery. Visitors prowl the scenic interpretive trail, and take a guided tour to the top of the tipple. Children explore the hands-on Kids Tour, and even collect a paycheque if it's Payday. Many take a ride in the Mantrip, a sort of miners' train, pulled by an antique battery locomotive. Historic characters and equipment demonstrations make the Atlas a fun and fascinating place to visit. During the Year of the Coal Miner, Drumheller joins with the communities of Canmore, Lethbridge, Crowsnest Pass, and Fernie to remember the men who dug for coal. For many, mining was good work. Digging coal put bread on the table, warmed the nation, and fuelled the economy. Beyond that, it created a brotherhood of miners that outlasted the mines themselves. Visit the Atlas Coal Mine and join daily tours, events, and demonstrations. Open May/June 9:30-5:30, July/August 9:30-8:30, fall hours vary Located 15 minutes from downtown Drumheller on the scenic Hoodoo Drive $5/person or $15 family; Mantrip Ride $1/person. at Badlands Passion Play Amphitheatre. Musicians, actors, storytellers evoke the days when coal was king every Wednesday evening in the wash house. Actors bring coal mining to life through a new play and historic vignettes all around Drumheller. Schedule to be announced. Historic downtown Drumheller comes alive every Saturday evening in July with music, historic vignettes, displays, food, and more. Coal miners and their families are invited to join dignitaries for the National Commemoration ceremony for the Atlas Coal Mine. Famous features and intriguing documentaries depict coal mining in all its faces.